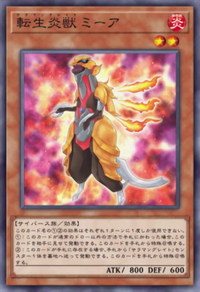 Main card page: "Salamangreat Meer"
If this card is added to your hand, except by drawing it for your normal draw: You can reveal this card; Special Summon it from your hand. If this card is in your hand: You can send 1 other "Salamangreat" monster from your hand to the GY; Special Summon this card from your hand. You can only use each effect of "Salamangreat Meer" once per turn. This page was last edited on 15 October 2018, at 23:45.